Note that the following is my best attempt at formalizing the rather haphazard way I cooked this dish tonight. Following the recipe precisely may have disappointing results, so pay attention to what you're doing! I typically cook things "until they're done", not some predetermined amount of time. I will update this recipe after I cook this dish a few more times. Cut the peppers vertically into thin strips and cut each strip in half. Peel the potatoes and cut them into think strips. Slice the onion into thin slices and cut each slice in quarters. 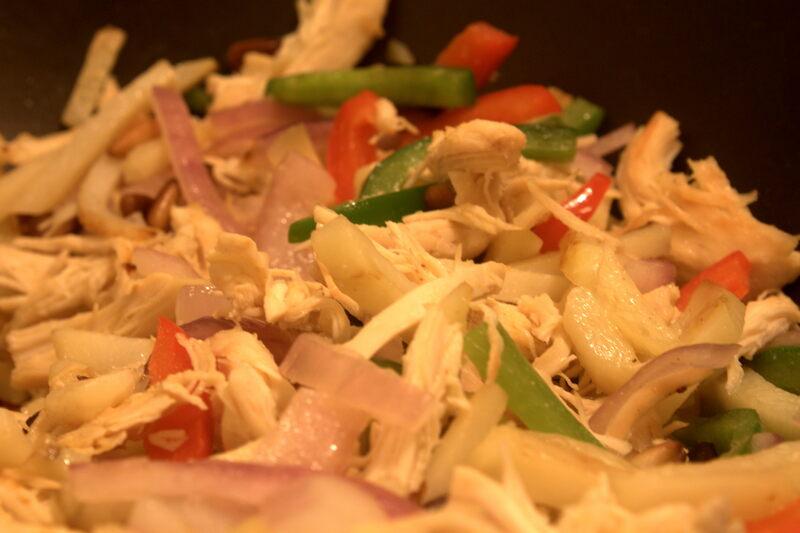 Place the chicken in a microwave-safe dish with a lid along with 1/8 cup of water. Cover chicken and microwave for 12 minutes at 70% power (assuming 1100 watt microwave). Heat 2-3 tablespoons of olive oil in a skillet at medium heat. When skillet is hot (oil should flow quickly when skillet is tilted), add potatoes. Depending on the size of the skillet, it may be necessary to cook potatoes in two batches. Transfer potatoes to a pot. Add onion, peppers, and 1/8 cup water. Cover and cook on medium heat for 10 minutes. Meanwhile, shred chicken (two forks work well for this) and transfer to skillet. Add 1/8 cup water, cover, and cook for 5 minutes or until fully cooked. Add chicken to pot and cook uncovered until water has boiled away. Cook pine nuts with 1-2 tablespoons of olive oil at medium heat until lightly browned. Add pine nuts to pot, stir and serve. My original plan was to include lime juice and cilantro, but I forgot them this time. I think I will try adding the lime juice and cilantro when cooking the chicken in the skillet next time. Hot peppers can be added to give it more of a kick. I would suggest cooking hot peppers in the skillet with the chicken. For a more savory flavor, rosemary and thyme, and basil can be added. These should probably be cooked in the skillet with the chicken, but it may be worthwhile to add them to the potatoes, too.